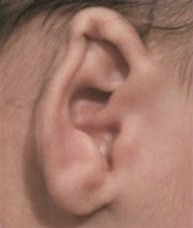 There are a number of different types of ear deformities (see below). Some ears improve over time, some require surgery after the age of four or five, and some children are forced to live with their defect. Unfortunately, we are not able to predict which ears will improve naturally, which ears will remain the same, and which ears will worsen. See some of the different types of ear deformities below for more information. Helical rim irregularities or compression may occur anywhere along th entire circumference of the helical rim. 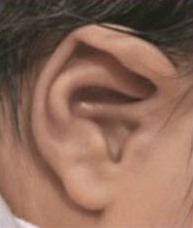 The Stahl’s ear deformity (Spock Ear, Elf Ear) is characterized by a transverse crus extending outward from the antiheli rather than continuing upward in a gentle bend as the superior limb of the triangular fossa. Stahl’s often presents with multiple or combinations of deformities. 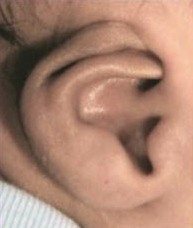 An advanced form of the prominent ear with an incomplete opening of the ear. Often characterized by very stiff and resistant cartilage around the scapha and helical rim that can feel as though a string envelopes the helical rim. 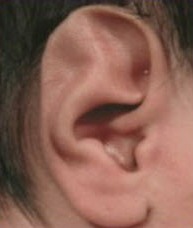 A folding over of the helical rim or upper third of the ear. It occurs when the superior limb of the antihelix or the fossa fails to properly form. 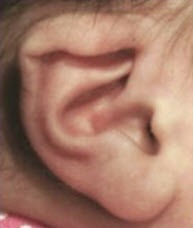 (See superior limb of triangular fossa in normal ear.) Lop ear is the severe expression of lidding. 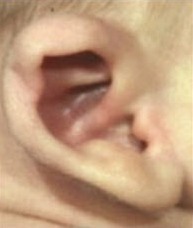 The conchal crus is an abnormal fold of cartilage crossing the mid portion of the concha symba that appears to divide the ear in half. It often results in prominent ear. 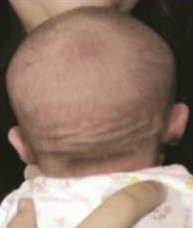 Presents as an abnormally protruding ear (Bat Ear, Dumbo Ear). The over-projection is significant and typically exceeds 9mm from the mastoid. Often is under-diagnosed or undiagnosed until too late for EarWell correction. The EarWell™ can be applied to a child’s ears within days after birth. Treatment must be started by 3 months of age to ensure full correction. It is worn for 4 to 6 weeks, with follow-up every 2 weeks at any of our clinic locations. EarWell™ requires no anesthesia, sedation, or medication because it causes no pain. It is non-surgical and non-invasive, and, best of all, it works. Even though we have a very high insurance approval rate for the EarWell™, there is no cost to the patient to submit for authorization to their insurance before committing to EarWell™ treatment.